For various courses we call on a range of tutors to support the size and range of participants. Alistair studied saxophone and piano at the Royal College of Music. During his time there he won several performance prizes. He also formed and led the Mistral Saxophone Quartet. Alistair now plays with the City of Birmingham Symphony Orchestra, the Birmingham Contemporary Music Group, the Northern Saxophone Quartet, Tribune Saxophone Octet, and is guest conductor of the Nottingham Symphonic Wind Orchestra. 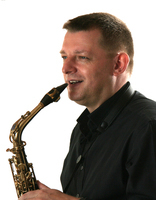 He also runs a very successful teaching business in Nottingham and is Visiting Scholar of Saxophone for Nottingham University. Julia Mills studied at the Trinity College of Music. 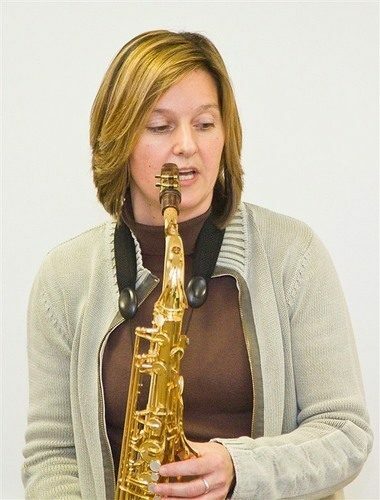 She played baritone sax in the world-famous "Fairer Sax", and since then has been a member of the Northern Sax Quartet. A highly versatile player, she is equally at home as a classical or jazz musician. She is in demand as a teacher, and as well as her private teaching she tutors on courses throughout the UK and in other educational establishments. Julia is also a member of the internationally-renowned Tribune Saxophone Octet, who have twice been invited to perform at the World Saxophone Congress. Naomi Sullivan studied at Chetham’s School, the Royal College of Music and Northwestern University. She has won numerous awards and prizes in the UK, Europe, and the USA- including with the Countess of Munster Trust, which supported her postgraduate studies in Chicago, and with whom she was a regular performer on the Trust’s recital scheme. She is currently performing with Kyle Horch in the Flotilla chamber group. Their debut CD is available through Big Shed Music. Naomi is a member of the Paragon Saxophone Quartet, with whom she has appeared on three CD recordings, Tuning In, Les Quatuors and Byrdland. She is also a member of Zephirus, which won the chamber music section at the Royal Over-Seas League competition in 2007. 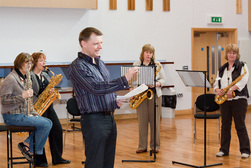 Future projects include a newly formed quartet focusing on commissioning and performing new music for saxophones. The group will be performing Facing Death as part of Birmingham Conservatoire's festival of the music of Andriessen. Other chamber and orchestral playing has included engagements with BCMG, Halle Orchestra, and Bournemouth Symphony Orchestra. 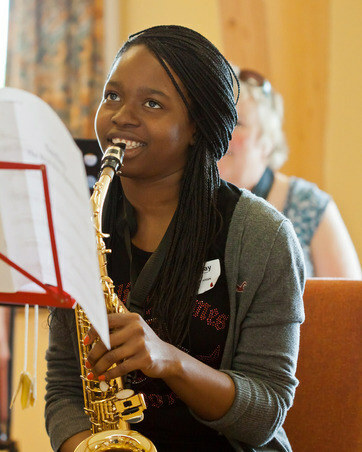 Naomi is Head of Saxophone at Birmingham Conservatoire. Sarah Markham studied at the Royal Northern College of Music (RNCM) gaining a Degree and Professional Performer’s Diploma (with Distinction), and at the University of Massachusetts, Amherst, USA where she gained a Master in Music Degree with scholarships from the Countess of Munster Musical Trust and the Sir James Caird Trust. She has enjoyed competition success with the Royal Over- Seas League Music Competition and the Park Lane Group. Sarah has performed all over Britain, including the Queen Elizabeth Hall and Purcell Room at London’s South Bank Centre, and at the Last Night of the Marble Hill Proms for English Heritage. Further afield, Sarah has performed in Germany, Belgium, Spain, Slovenia, America and Canada. She has also broadcast live on Radio 3 and Classic FM radio. Sarah also plays baritone saxophone in the Northern Saxophone Quartet, and is a member of the Tribune Saxophone Octet. 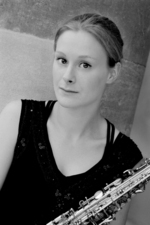 Sarah is the saxophone teacher at the Junior department of the Royal College of Music, and the Universities of Huddersfield and Sheffield. In 2006, Sarah released her first solo album featuring standard works from the classical saxophone repertoire. Nicola's interest in the science and psychology of music has led her to achieve a Masters in Performance Science from the Royal College of Music. Nicola balances a busy teaching diary with regular performances. As an ensemble player she plays with a number of groups. She is a founder member of the Equinox Saxophone Ensemble, and is a longstanding member and currently chairman of the award winning Nottingham Symphonic Wind Orchestra. 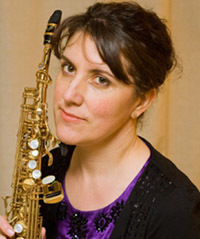 As a principal player with the National Saxophone Choir of Great Britain, she performed at the Edinburgh Festival Fringe in 2005. She was part of the organising committee in 2012 for the World Saxophone Congress. In 2009 she released her first solo album, a personal collection of chamber pieces for saxophone. Chris Jolly studied at the University of Huddersfield completing an MMus in composition in 2010. As a composer his work has been played throughout the country, including at the Purcell Room in London. He is also in demand as a teacher and performer, playing with many orchestras and chamber groups, including the Northern Saxophone Quartet.